Each actor is configured to be run on a MessageDispatcher, and that dispatcher doubles as an ExecutionContext. If the nature of the Future calls invoked by the actor matches or is compatible with the activities of that actor (e.g. all CPU bound and no latency requirements), then it may be easiest to reuse the dispatcher for running the Futures by importing context.dispatchergetContext().getDispatcher(). This will cause the current thread to block and wait for the ActorAbstractActor to ‘complete’ the Future with its reply. Blocking is discouraged though as it will cause performance problems. The blocking operations are located in Await.result and Await.ready to make it easy to spot where blocking occurs. Alternatives to blocking are discussed further within this documentation. Also note that the Future returned by an ActorAbstractActor is a Future[Any]Future<Object> since an ActorAbstractActor is dynamic. That is why the asInstanceOfcast to String is used in the above sample. Another useful message-transfer pattern is “pipe”, which is to send the result of FutureCompletableFuture to another actor, upon completion of the FutureCompletableFuture. The pipe pattern can be used by importing akka.pattern.Patterns.pipe.akka.pattern.pipe, and define or import an implicit instance of ExecutionContext in the scope. val future = target ? "some message"
To see how this works in more detail, let’s introduce a small example consisting of three different actors, UserProxyActor, UserDataActor and UserActivityActor. 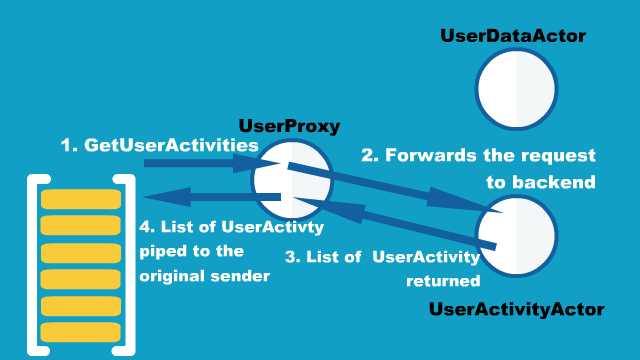 In this example, when you need information about a user, you send a request message to UserProxyActor, then it gets the corresponding result from the appropriate backend actor based on the request message type. and UserData and List[UserActivity]ArrayList<UserActivity> are returned to the original sender in the end. 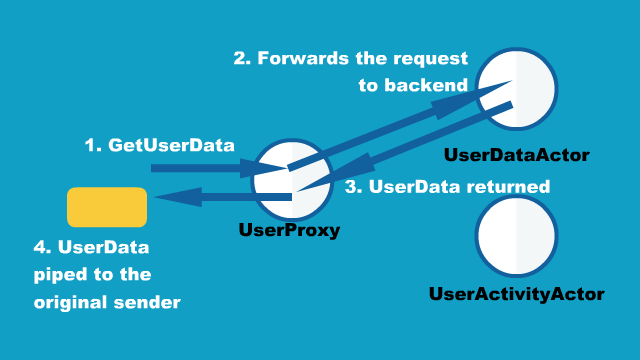 UserDataActor holds the data in memory, so that it can return the current state of the user data quickly upon a request. On the other hand, UserActivityActor queries into a repository to retrieve historical user activities then sends the result to the sender() which is UserProxy in this case, with the pipe pattern. Since it needs to talk to the separate repository, it takes time to retrieve the list of UserActivity, hence the return type of queryHistoricalActivities is FutureCompletableFuture. To send back the result to the sender() we used the pipeTopipe method, so that the result of the FutureCompletableFuture is sent to sender() upon FutureCompletableFuture’s completion. Finally, the definition of UserProxyActor is as below. Note that the pipeTopipe method used with the ?ask method. Using pipeTopipe with the ?ask method is a common practice when you want to relay a message from one actor to another. akka.pattern.retryakka.pattern.Patterns.retry will retry a Future classCompletionStage class some number of times with a delay between each attempt. After adding any additional computation stage to CompletionStage returned by scala-java8-compat (e.g. CompletionStage instances returned by Akka) it falls back to standard behavior of Java CompletableFuture.